There’s no shortage of superlatives to describe Orlando’s apartment market performance over the past few years. 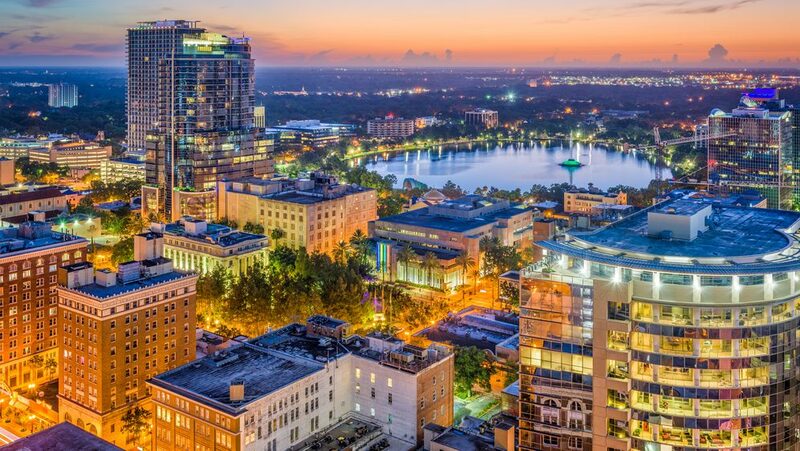 Orlando has ranked among the nation’s top 10 markets for annual rent growth in each of the last seven quarters, with 3rd quarter 2018’s annual growth of 6.6% ranking second best nationally. 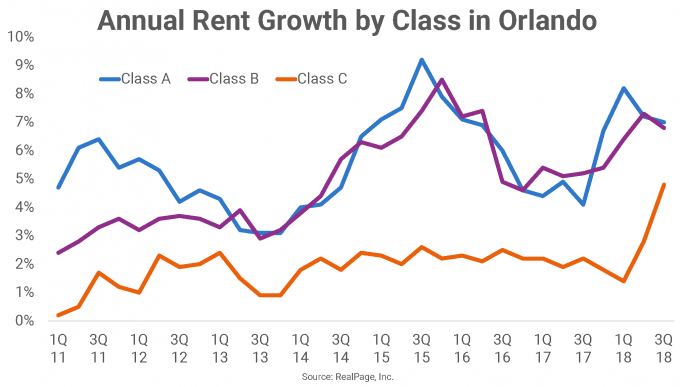 While the phrase “rising tide lifts all boats” holds water in most instances, that hasn’t been the case until most recently in Orlando, when Class C annual rent growth surged to 4.8% in 3rd quarter 2018. Prior to this performance, Class C has significantly trailed the more expensive asset classes, with rent increases rarely reaching 2.5%. Taking a look at annual rent change since 2011 in Orlando, Class A growth has led all product classes for the majority of this cycle. Dating back to 2011, Class A growth has averaged 5.6% in Orlando, which ranks fifth best nationally, trailing only the three California Bay Area markets and Sacramento. Class C performance, on the other hand, has been substantially softer. Since 2011, that asset class has only managed 1.9% growth on average. The difference of 370 basis points (bps) between Class A’s average (5.6%) and Class C’s average (1.9%) is the single largest spread between those two classes in the nation’s top 50 markets. Occupancy has strengthened in Orlando throughout the course of this cycle as well. As the local housing market was among the hardest hit nationally during the recession, occupancy rates in Orlando as of 4th quarter 2009 (90.8%) ranked 37th among the 50 largest markets. But as of 3rd quarter 2018, Orlando (96.8%) ranked sixth-best in the nation – a improvement of 600 bps. Even more remarkable is the improvement of Class C occupancy. As of 1st quarter 2011, Class C occupancy was a paltry 89.3%. But as of 3rd quarter 2018, occupancy was all the way up to 99%. That is the highest rate for any asset class in any of the 50 major markets. This begs the question: why has Class C rent growth lagged despite the apparent demand for apartments that caused Class C occupancy to soar? One possible reason is that rent-to-income ratios are higher in Class C product compared to Class A and Class B. 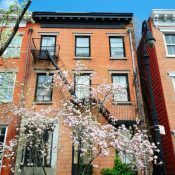 Previous RealPage studies have found that the median rent-to-income ratio among renters in Class A product is no higher than 22% on average. Class B product is negligibly higher at 23%. 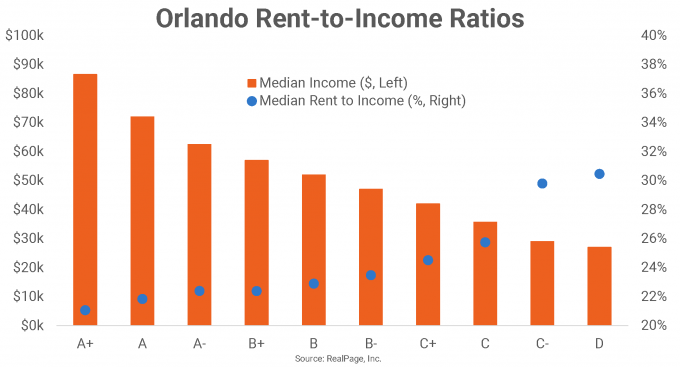 But for Class C product, the median rent-to-income ratio ranges from roughly 25% in Class C+ to 30% in Class C- product. Hence, the larger median rent-to-income ratio among Class C product places generally leaves less room for rent growth than in its Class A counterpart. Another reason for lack of significant rent growth in Class C product despite strong occupancy rates lies in the local economic makeup. Orlando’s economy has a sizable portion of workers in the Leisure and Hospitality sector. Roughly 21% of Orlando’s employment base falls within this sector, a byproduct of the massive tourism industry in central Florida. That 21% is almost double the national average of 11.4%. From a growth perspective, Orlando’s overall employment base has expanded 33.7% since December 2009. For comparison, the market’s Leisure and Hospitality segment has grown by 42.6%. 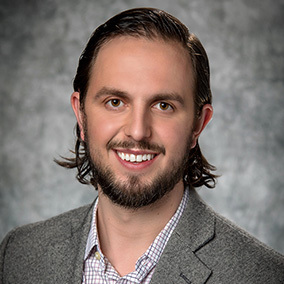 With such a large concentration of Leisure and Hospitality workers in the market – traditionally a lower-wage segment of the economy – it stands to reason that demand for Class C product is perennially strong in Orlando, especially considering the pace of job growth within that segment.